Jerry is the extension forage specialist with Cornell University. Debbie is an extension dairy nutritionist at Cornell. Perennial grass is sown with alfalfa on nearly 90 percent of all alfalfa acres in New York. There is growing interest in alfalfa-grass mixtures across the northern United States. Grass tends to be considerably higher in neutral detergent fiber digestibility (NDFD) than alfalfa. Feeding trials in both New York and Wisconsin have shown that grass in a mixture with alfalfa can produce as much or more milk than pure alfalfa in dairy rations. Higher quality forage varieties also have been shown to result in higher milk production. Although high forage quality is critical for milk production, it is rarely economical if it also comes with any decline in forage yield. Alfalfa-grass grown on productive soils often results in higher yields than pure alfalfa. Higher quality alfalfa or grass is likely to raise the proportion of homegrown feeds in rations. Almost all alfalfa seed companies have “high-quality” varieties. Claims may be based on characteristics such as fine stems, lower lignin, higher digestibility, higher relative forage quality, high multifoliolate leaf expression, higher feed intake, or improved milk production. Improved fiber digestibility is the most important quality trait. 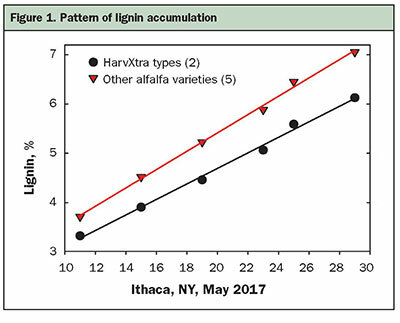 Expression of high forage quality appears to be relatively consistent across the northern U.S. Reduced-lignin, HarvXtra-type alfalfa is consistently lower in lignin than other high-quality alfalfa varieties throughout spring growth (Figure 1). Much less research has been conducted to develop perennial grasses with higher forage quality. Several studies in the Northeast and Midwest have concluded that meadow fescue tends to have higher NDFD than other grasses. Meadow fescue is very winterhardy, but likely will have somewhat lower yields than tall fescue. A recent study with orchardgrass varieties concluded that ranking of varieties is not consistent over regions of the country. Recent research also indicates that forage quality of grass species is not consistent across the country. Many factors impact the grass percentage in mixtures, possibly the greatest of these is the moisture status of the soil for three weeks post planting. Alfalfa can usually cope with drought stress following seeding, but grasses can be devastated by drought right after the grass seed has enough soil moisture to germinate. Therefore, the later the seeding in the spring, the more likely that grass will be negatively affected by drought. Grass species and seeding rate also will have a major impact on the eventual grass percentage in the established mixture. Anything that improves the soil environment for alfalfa, such as raising soil pH, soil drainage, or soil potassium, will likely reduce the grass percentage of mixtures. Ideally, we would like 20 to 30 percent grass in mixtures. 1. When hay brokers want pure alfalfa hay. 2. When there is little information on the compatibility of a grass species with alfalfa. 3. When a very consistent quality of forage is desired. 4. When soil is consistently droughty. Average NDFD in 2017 New York trials was determined by weighting NDFD for yield, such that higher yielding spring-cut forage counts more than lower yielding fall-cut forage. Across several trials, average NDFD (not including HarvXtra alfalfa or meadow fescue) was 53 percent for alfalfa and 68 percent for grass. Reduced-lignin HarvXtra alfalfa averaged 5.3 percent higher NDFD than other alfalfa varieties, while meadow fescue averaged 9.7 percent higher NDFD than other grass species tested. 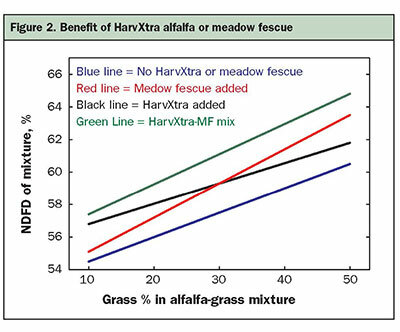 We calculated the potential benefit in NDFD from adding either HarvXtra or meadow fescue to an alfalfa-grass mixture (Figure 2). 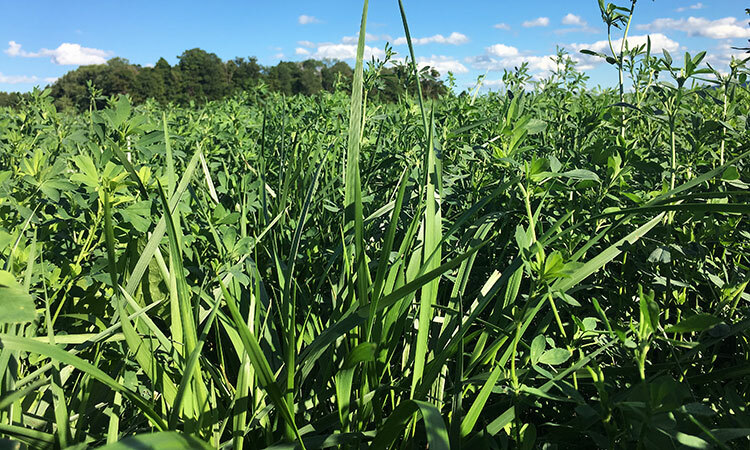 With 70 percent alfalfa in a mixture, using HarvXtra boosts total forage NDFD from 57.5 to 59 percent, but including only 30 percent meadow fescue in a mixture in place of other grasses also increases total forage NDFD to 59 percent. Using both HarvXtra and meadow fescue improves total forage NDFD by 6 percent, or a 4.5 percentage unit benefit. The added cost of changing alfalfa varieties or grass species in a mixture comes solely from the cost of seed. If we assume that HarvXtra seed costs are about $6 per pound more than other high quality varieties, and it is seeded at 14 pounds per acre, then over the average life of a stand (4 years) HarvXtra would cost about $20 more per acre. Meadow fescue seed does not cost significantly more than other grasses. 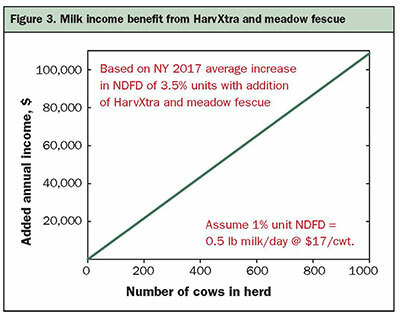 Assuming an increase of 1 percentage unit NDFD boosts milk production by 0.5 pounds per day (average of numerous feeding trials) and a milk price of $17 per hundredweight, a 1,000 cow herd could improve annual milk income by over $100,000 by replacing normal alfalfa varieties and commonly used grasses with a HarvXtra-meadow fescue mixture (Figure 3). Forage species and variety changes are essentially size neutral, with equal benefits per cow for small or large herds. Switching to any alfalfa or grass variety with significantly higher NDFD is going to be worth any extra seed costs. Under most conditions, it can be economically advantageous to include a perennial grass in an alfalfa seeding. Seeding high-quality alfalfa or grass can significantly improve milk income. Relative quality ranking of alfalfa varieties appears to be fairly consistent in the North. Grasses, on the other hand, may not produce consistent results for either yield or quality across regions. Local grass species and variety testing is essential. With the precipitous decline in forage applied researchers across the U.S., less forage grass testing is unfortunately the more likely scenario for the future. This article appeared in the August/September 2018 issue of Hay & Forage Grower on pages 10 and 11.